Customize iTerm2 with Color Schemes, Syntax Highlighting instead of the usual non transparent background, appealing text color etc. with scripts. Here is how to. 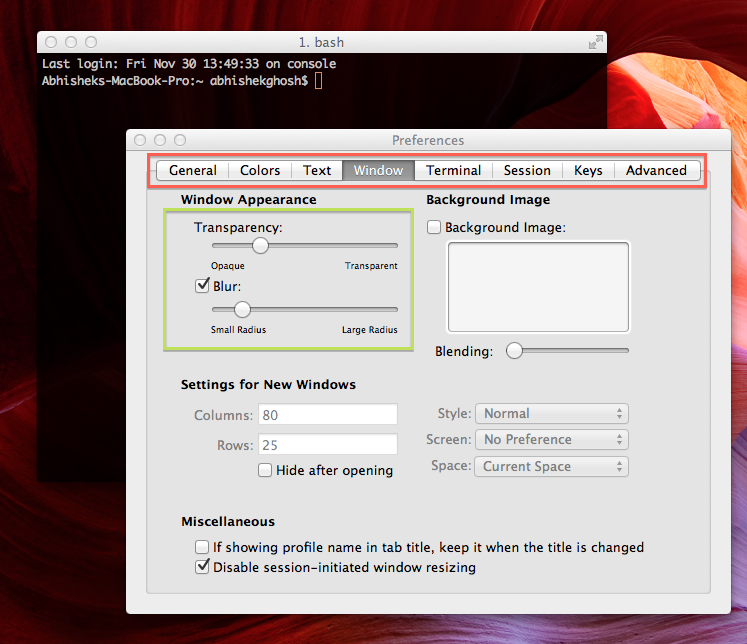 If you are a Windows PC user, this guide to Customize iTerm2 is not for you. We have equivalent guide for Windows – Console2 Customization and UNIX Functions. You can basically apply the methods mentioned in this guide to Customize iTerm2 and the above linked guide for Ubuntu or any Linux Terminal. You can change most of the settings by selecting the options from the tabs (indicated in screenshot by bounding red box) and choosing options (bounding green box as example). This is very basic method to Customize iTerm2 with Color Schemes, translucent window, blurring effect, blinking cursor etc. Cite this article as: Abhishek Ghosh, "Customize iTerm2 with Color Schemes, Syntax Highlighting," in The Customize Windows, November 30, 2012, April 21, 2019, https://thecustomizewindows.com/2012/11/customize-iterm2-with-color-schemes-syntax-highlighting/.